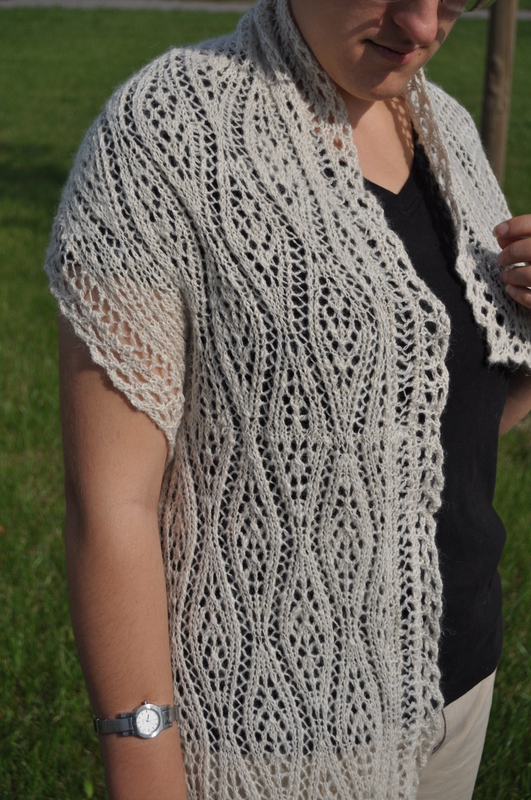 Partly because I wanted to remember that I thought that this lace pattern would make a great lacy sweater. 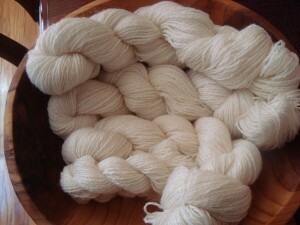 Fast forward two years, and you’ll find me with a bowl of yummy Falkland handspun just waiting for a project. Which happens to be another in a long series of completely unphotographable colors that have emerged from my dye studio. 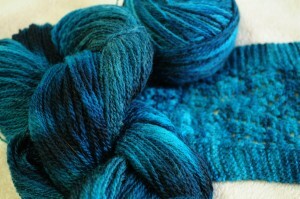 That photo gets the intensity right, but leans a little too far toward the blue for the real yarn. In any case. I swatched, I cast on. I knit a full repeat. I decided that I was going to run out of yarn at that rate, pulled back, went up two needle sizes and swatched again, reduced my stitch count by 30%, and cast on again on the plane to Rhinebeck. 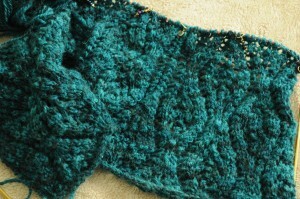 This second photo is a little closer to the real color, and shows the lace pattern beginning to emerge. She has perfect timing, too, since I had just lost my stitch markers and was in need of more. Knowing me, I’d probably have gone for plain plastic rings, so I’m especially excited to have some fancy jewelry for my needles. Those colors match the lace prefectly, too. Aren’t they pretty? I’m just finishing up the waist shaping now, and beginning the repeat that will increase for the bust and underarm split. Knock on wood, but it looks like I might actually have enough yarn to make it at this gauge. Fingers crossed! How lovely! Cannot wait to see your progress! Excellent! 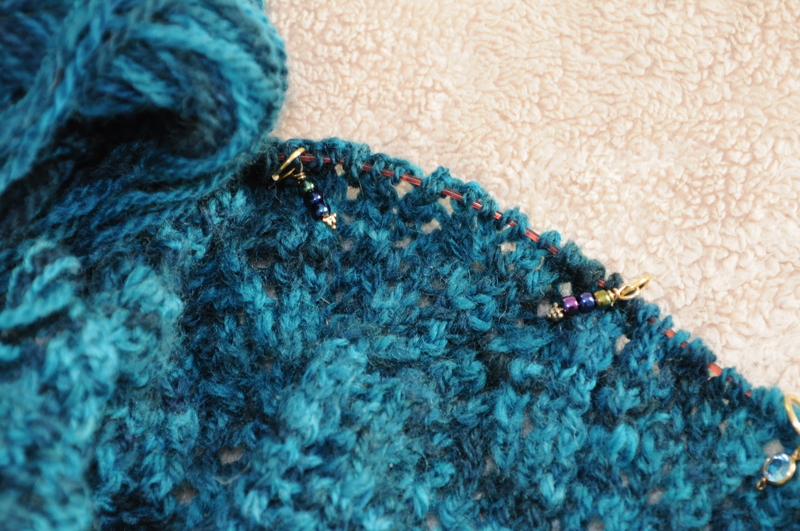 (And yes, those are lovely stitch markers – Jan and Ellen seem to have a talent that way :).) I can’t wait to see the final product – I bet this one is going to be a beauty. Another lovely color! 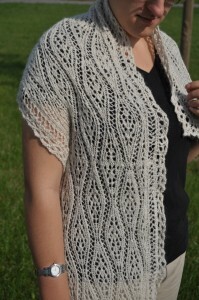 It will be beautiful in the lace pattern. Lovely stitch markers, too. I love that they coordinate with your project. I have several sets of “dangly” stitch markers in different colors, and it’s so much fun to try to coordinate them with the knitting! Is this going to be another one of those “knit a fabulous sweater but don’t write up the pattern” deals? ‘Cause if it is, I’m going to be the first in line to complain. If it isn’t, I’ll be the first in line to volunteer as a test knitter! DesigKnit is powered by	WordPress 4.8.9 . Page generated in 0.301 seconds using 41 queries.